How Are Taxes on Social Security Benefits Determined? Social Security beneficiaries with income equal to or below $25,000 (for unmarried taxpayers) or $32,000 (for married couples filing jointly) pay no taxes on their benefits. About half of all recipients were in that tier in 2014. Beneficiaries with income that is higher than those thresholds but no higher than a second set of thresholds—$34,000 for unmarried filers and $44,000 for joint filers—pay taxes on up to 50 percent of their benefits (with the percentage increasing from 0 percent to 50 percent as income rises). For beneficiaries with income that is above those higher thresholds, as much as 85 percent of the benefits are taxed (again, with the percentage increasing as income rises). The income measure that is used to determine how much of a recipient’s benefits are taxed is a modified version of adjusted gross income (AGI). AGI includes income from all sources not specifically excluded by the tax code, minus certain deductions; modified AGI differs from AGI in that it also includes nontaxable interest income, as well as one-half of a recipient’s Social Security benefits, even if those benefits are ultimately determined not to be taxable. Under that structure, the share of a taxpayer’s benefits that is taxed varies with both the taxpayer’s Social Security benefits and the taxpayer’s other income. For example, an unmarried taxpayer who received $5,000 in Social Security benefits would owe no taxes on those benefits until his or her modified AGI was above $25,000; once modified AGI exceeded about $36,000, that taxpayer would owe taxes on 85 percent of those benefits. By contrast, an unmarried taxpayer who received $20,000 in Social Security benefits would owe taxes on 85 percent of his or her benefits only after his or her modified AGI exceeded about $49,000 (see the figure below). For taxpayers with income in the ranges over which a larger percentage of Social Security benefits become subject to tax, marginal tax rates on income other than Social Security benefits (that is, the additional amount paid in taxes for each additional dollar of such income) are higher because of the tax treatment of Social Security benefits. 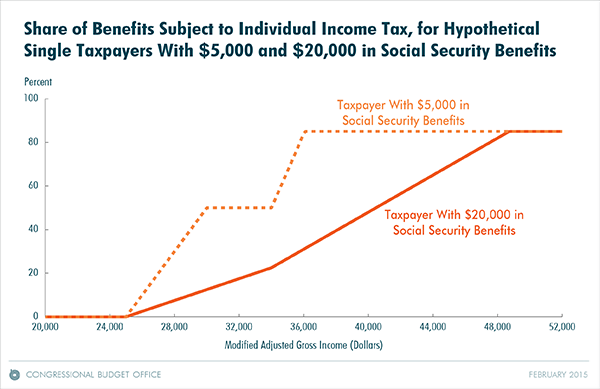 For example, those single taxpayers with $5,000 of Social Security benefits in the example above would see their marginal tax rate on non–Social Security income boosted by 50 percent if their modified AGI was between $25,000 and $30,000 and by 85 percent if their modified AGI was between $34,000 and $36,000. Those higher marginal tax rates reduce people’s incentives to work and save. More economic analysis regarding the taxation of social security benefits can be found in this CBO report.